One of the most serious problems you will likely experience with your garage door would be broken springs. Your garage door springs suffer a lot of wear and tear over time, and many times the result is broken springs or springs that are near the breaking point. If your torsion springs are broken, this can be a very serious matter. Repairing these broken springs can be one of the most dangerous repair jobs of the garage door. The garage door springs help to keep the garage door on its track and aid in its smooth operation. If the garage door springs are damaged, the door can completely collapse, possibly causing serious injury or even death if it happens to fall on someone who may be entering or leaving the garage. For that reason, garage door springs should ideally be checked for safety at least once every five or six years. Your garage door springs can easily wear out over time, from the constant opening and closing of the garage door. After a period of about five or six years, there is usually enough damage to your garage door springs to warrant repair. If you notice that your torsion springs have worn or are wearing out, DO NOT ATTEMPT TO REPAIR THEM YOURSELF! This is a job that should definitely be left up to the professionals to ensure proper safety. One of the biggest risks is that the door could fall on top of you while you are attempting to repair the broken springs! The stakes are simply too high to attempt to repair broken springs of a garage door without proper training. Our Garage Door Repair and Overhead Door Repair professionals are well trained and reliable enough to undertake such a task. 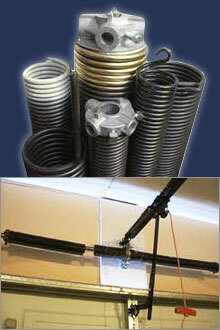 We can provide service for all of the top brands of broken garage door torsion springs. Our products are compatible with Marantec, Liftmaster, Chamberlain, and Genie. We also have replacement kits for Craftsman and Sears brands. Just leave this dangerous job up to our skilled technicians and you can be assured that our professionals will do the job correctly. Remember, proper maintenance by having one of our professionals check those garage doors springs every five or six years can prevent you from dealing with broken springs! 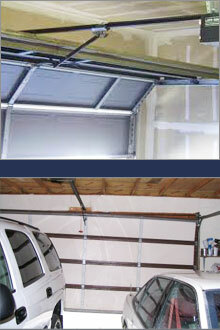 The constant opening and closing of the garage doors can also wear heavily on your tracks and rollers. This could result in broken tracks and garage door rollers or misalignment. As the broken tracks and garage door rollers become more damaged, you may begin to notice a lot of noise while opening the garage door. This noise is a clear indicator that something is wrong. The broken tracks and garage door rollers can become misaligned, which may cause the doors to become difficult to roll up or down. Sometimes a simple lubrication treatment will be all that is needed to get the tracks and rollers moving again, but other times, they may need to be completely replaced. 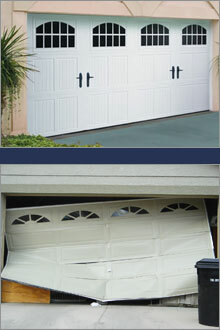 Broken tracks and damaged garage door rollers can compromise the entire operation of your garage doors. Our well-trained professionals will replace your broken tracks and damaged garage door rollers to the highest standards. Your garage door rollers will be rolling smoothly once again, and your broken tracks will be as good as new! As mentioned before, especially if your garage door is broken at the tracks and uses torsion springs, this repair should be left up to the professional. Our friendly professionals will provide you with the work that is needed to repair your broken tracks and garage door rollers and our guarantee of your satisfaction. Soon, your garage door will run as smoothly as new. 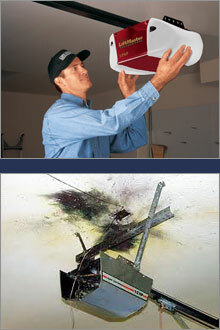 We proudly service all the top brands from Genie, Craftsman, Sears, and Liftmaster. We also service products from Marantec and Chamberlain. We stand behind our work and we strive to keep our customers satisfied. The garage door opener or garage door remote should make it easy to open your garage doors safely. If there is a problem, or if you hear a lot of noise while using your garage door opener, it may be in need of repair. It may not respond to the commands of opening or closing the door, or it may need to be updated. If your garage door and garage door opener, or garage door remote was made before 1993, it will need to be updated, as those earlier devices were unable to reverse. We can repair your garage door opener, or garage door remote, or if needed, we are also able to replace it with a new one. If your garage door remote, or any of its components is from the following brands, we guarantee replacement or repair of your devices. We service Chamberlain, Marantec, Genie, and Craftsman products, as well as Liftmaster and Sears equipment. Ideally, your garage door opener, or garage door remote should be checked monthly to make sure that it is in good working order. Most of the time, it may be something as simple as the batteries need replacing, or you could be in need of a major overhaul. If your garage door opener does not work properly, even with fresh batteries that is a major sign that something else must be amiss. The drives and pulleys may be needed to be adjusted, or the entire system may need re-wiring or complete replacing. If you have fresh batteries in your garage door remote, and still experience problems with its operation, you should call our professionals. We will be able to diagnose the problem and repair it as needed. Our professionals will let you know if the problem is just as simple as the garage door opener needs to be replaced, or if the problem is more complex in nature. Is your garage door broken? At Garage Door Repair and Overhead Door Repair, we can handle full garage door replacement, or we can just the garage door's broken panels. If it is only the garage door panels that are damaged or cracked, you can save money just having replacement panels installed by our professionals. If your overhead door needs to be repaired or replaced, consult our professionals at our Overhead Door Repair center. Our garage door repair professionals are very diverse, and they are very knowledgeable in all phases of garage door repair work. We repair or offer garage door replacement and garage door panels from the top companies such as, Genie, Marantec, Liftmaster, Chamberlain, Sears and Craftsman. You can be assured that your garage doors and garage door panels will look as good as new. Whether we repair your existing doors or panels, or replace the entire door, we guarantee that you will be pleased with your finished product. If your garage door is broken, you have definitely come to the right place. We are capable of repairing your garage doors and garage door panels in the most professional manner available.